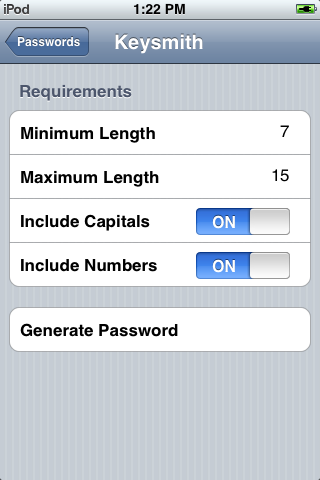 Keysmith is an alphanumeric password generator for your iPhone or iPod Touch. Now you can easily create decent passwords of various strengths for websites, without having to pound on randomly on your keyboard. 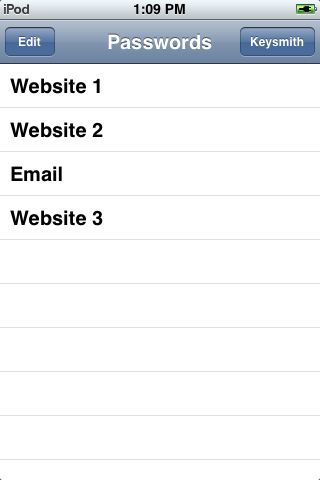 With the iPhone OS 3.0 update and above, Keysmith also allows you to copy the password into the clipboard, allowing you to easily enter it into websites. Random Lengths - Choose a minimum and maximum length and Keysmith will pick a random length between the two, so no one will know how long your password is. Capitalization and Numbers - Keysmith is capable of randomly capitalizing letters, as well as litering the password with numbers, to increase the strenght of the password. Clipboard Support - On OS 3.0 and up, Keysmith allows you to copy the password to the clipboard for convenience. Save Your Passwords - Keysmith can save your passwords! Now you can easily pull up passwords you created before, and copy them to the clipboard or view them. NOTICE: Keysmith does not use encryption, so do not save vital passwords. It is also recommended that you set a pass code on the lock screen of your device, to prevent other people from easily accessing the application.